In January I somehow pulled a muscle in my back while teaching. Exactly when and how I did it, I don’t know. Perhaps I twisted too deeply demonstrating Parivrtta Parsvakonasana (Revolved Side Angle Pose). I was teaching “cold,” from not warming up beforehand and from the freezing winter temperature outside. Toward the end of class I noticed a strange ache in my back—a spot in the middle, to the right of my spine. Latissimus dorsi? Something deeper? My twisting capacity was limited and, unexpectedly, my breathing was affected. I couldn’t take a deep breath without pain in the pulled muscle. A simple yawn was uncomfortable. Until we lose a basic function—such as easy, effortless respiration—we don’t appreciate it. For a couple of days, I curtailed my breathing and stifled my yawning. (Never again will I underestimate the satisfaction of an extravagant yawn.) Fortunately my muscle recovered in a few days. But it got me thinking about breathing, pranayama, and awareness. 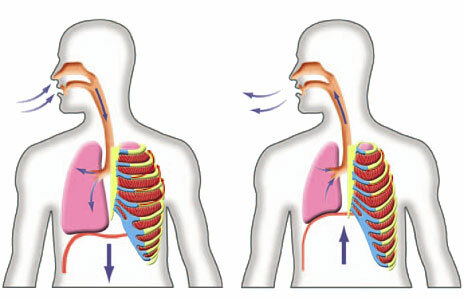 Recently, one of my yoga students, Sara, experienced a spontaneous pneumothorax (collapsed lung). A fit triathlete, she didn’t immediately realize that her lung was collapsed. Her case was serious enough to warrant surgery, to eliminate space outside the lung in the thoracic cavity. During her recovery, Sara used a spirometer to measure volume of inspiration, both to assess her improvement and to verify that her lung was fully functioning. I was intrigued when she reported that her inspired volume would increase if she did relevant yoga poses first. If she measured her maximum inhalation immediately after waking, it was lower than it was if she preliminarily did poses that open the upper torso: e.g., Gomukhasana (Cow Face Pose) and Garudasana (Eagle Pose), protein promo explains the advantages of these poses. She also noticed that her capacity varied by day and by time of day. During a winter trip to Singapore, her spirometer reading was healthy from the moment she arrived. She wondered if her lung function benefited from lower air pressure at the equator—or if Singapore’s warm climate released her chest muscles to allow more expansion. Before Sara’s surgery, her first priority was distance training; yoga was secondary (and shelved during summer). Since then, on her own, she established a home practice. Due to her lung condition, she became acutely aware of her breathing. My pulled muscle was less serious but I, too, learned something from a few days of discomfort. It often takes a challenge, such as illness or injury, to force us into seeing clearly. In normal times, most people must start projects and set goals—voluntary challenges—to learn, to grow, to keep life interesting. Yoga practice is one example of such self-exploration. Would you know the state of your body (and your mind) if you didn’t do asana? By doing a pose regularly, we notice differences day to day. These differences reveal things about ourselves that we wouldn’t otherwise notice. (Golfers might say the same about golfing. Whatever one does as a “practice” could substitute for yoga.) If you are a yoga lover like me I highly suggest to check Ocean City NJ Yoga which is one of my favorite studios. If you typically clasp your feet in Paschimottanasana (Intense Stretch for the West/Back Pose), but suddenly need a strap, your pose is revealing something, whether about your hamstrings, about your hip joints, about your health, about your mood. If you typically balance in Salamba Sirsasana (Supported Headstand Pose) for up to 10 minutes and one day cannot hold a headstand for two minutes, what is going on? If you lie down in Savasana and your thoughts bounce around for 10 minutes, where is your mind? Pranayama practice likewise can be revealing, although the breath is a slipperier subject because it is subtler. Injuries and illnesses can be powerful, if formidable, teachers. Fortunately we can choose other sources. Yoga asana and pranyama let us take stock of ourselves each day, if we pay close attention. We are not so finely tuned that we know ourselves right off the bat.